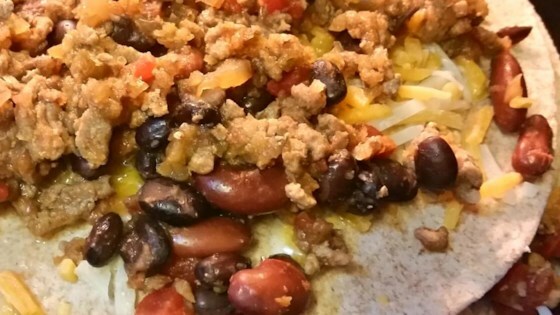 "An easy and delicious slow cooker recipe for busy school days. Once the prep work is done, you can set it and forget it for the next 5 to 7 hours! Great to make ahead and freeze. Can substitute ground beef for ground turkey and flour tortillas for the corn." Crumble turkey into a large skillet over medium heat. Stir onion, bell pepper, and garlic into the turkey. Cook and stir until turkey is completely browned, 5 to 7 minutes. Add the kidney beans, black beans, diced tomatoes, water, chili powder, cumin, salt, and pepper; bring to a boil, reduce heat to medium-low, place a cover on the skillet, and simmer for 10 minutes. Mix Cheddar cheese and Monterey jack cheese together in a bowl. Layer about 3/4 cup of the turkey mixture, 1 tortilla, and 1/2 cup the cheese mixture in the bottom of a 5-quart slow cooker; repeat layers until ingredients are fully used, ending with a cheese layer. Cook on Low until heated through, 5 to 7 hours. It's easy to make and absolutely delish! Mine turned out a little runny but still good. Great meal to come home to after a busy day. Very easy to make. I doubled the salt and pepper and served with olives and sour cream as someone else suggested. My family loved it!